Terrains of Memory and Self,” Catalogue Essay for Lalla Essaydi exhibit, PA: Lafayette Art Galleries and The Trout Gallery: The Art Museum of Dickinson College (Feb. 9- May, 2018), 2018. Lalla Essaydi (b. 1956, Marrakesh) grew up in Morocco, raised her family in Saudi Arabia, and relocated to France and finally the United States. 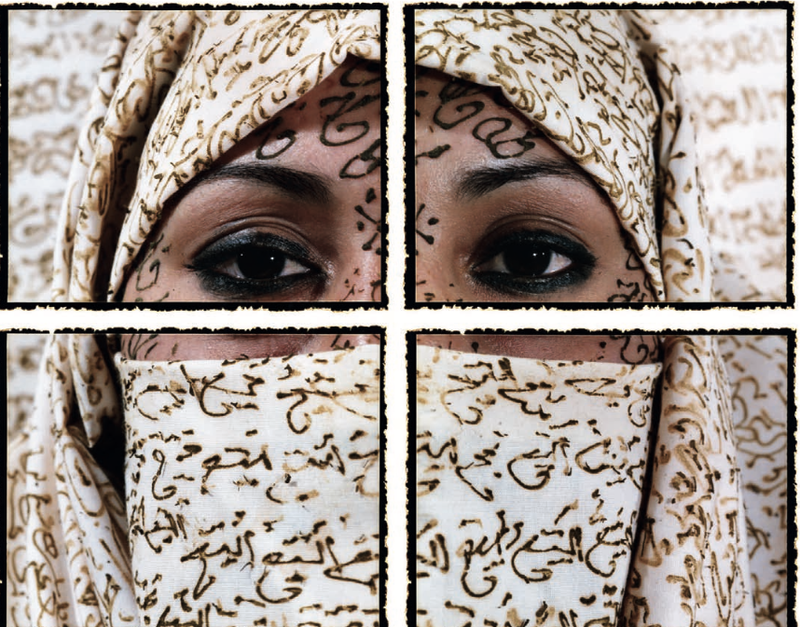 Her work opens perspectives into cross-cultural identity politics, creating views that draw together culturally embedded materials and practices—including the odal- isque form, Arabic calligraphy, henna, textiles, and bullets—to critique the narratives that have been associated with Muslim women throughout time and across cultures. By plac- ing Orientalist fantasies of Arab women and Western stereotypes in dialogue with lived realities, Essaydi presents identity as the cul- mination of these legacies, yet something that also expands beyond culture, iconography, and stereotypes. Essaydi studied at the École nationale supérieure des Beaux-Arts in Paris before earning her BFA from Tufts University and MFA from the School of the Museum of Fine Arts, both in Boston. Her work has been exhibited around the world, including at the San Diego Museum of Art, CA; Museum of Fine Arts, Boston, MA; Bahrain National Museum; and Sharjah Calligraphy Biennial, United Arab Emirates. Essaydi’s work is represented in the collections of the Los Angeles County Museum of Art, CA; Art Institute of Chicago, IL; Museum of Fine Arts, Houston, TX; National Gallery of Art, Washington, DC; Brooklyn Museum of Art, NY; Museum of Fine Arts, Boston, MA; and the Musée du Louvre, Paris, amongst many others. The faculty of memory is increasingly detached from academic learning and knowledge. The dependence on technology and artificial intelligence in both schol- arship and daily life has redefined, however, rather than replaced memory. In an era hinged on simulacra and the selfie, memory has been transformed into a final, somewhat inviolable outpost of subjectivity and identity. It can enact terrains of resistance in a world where social, economic, and political systems increasingly make individuals feel powerless. As Andreas Huyssen writes, memory can “claim some anchoring space in a world of puzzling and often threatening heterogeneity, non-synchronicity, and information overload.”2 Memory, both personal and cultural, forms the beating heart of Lalla Essaydi’s art. The artist’s photographic mise-en-scènes illustrate memory’s protean potency, particularly for subjects straddling multiple geographies and cultural imagi- naries. They also plot its intersection with issues of gender, language, the history of representation, and cross-culturality. Lalla Essaydi has produced multiple series of photo- graphs—Converging Territories (2002–04), Les Femmes du Maroc (2005–08), Harem (2009), Harem Revisited (2012–13), Bullets (2009–14), and Bullets Revisited (2012–13)—which trace the artist’s deploy- ment of memory over time as well as highlight other central themes in the artist’s work, like female agency, plural identity, Orientalism, and Islamic aesthetics.3 From the perspective of visuality, the artist is identified with large-scale, beautiful images of Middle Eastern women in clothing and spaces that simultaneously appropriate and challenge traditional Islamic cultures and Orientalist painting and tropes. Cultural critique imbues Lalla Essaydi’s work, yet it transcends either simplistic Neo-Orientalism or East-West binarism, a transcendence largely enabled by her plural identity.4 Essaydi’s life, like her work, evinces polyculturalism: born and raised in Morocco, the artist has lived in Saudi Arabia, France, and the United States and now divides her time between Boston and Marrakesh. the onlooker’s gaze, the woman posits her agency, thereby thwarting her depersonalization on sexual, racial, or religious grounds. Bill ashcroft and his coauthors describe the resistance to oppression oper- ated through the reversal of the gaze as “the displac- ing gaze of the disciplined, where the observer becomes the observed.”6 However, the fact that fully facially-veiled women or women seen only from the back nonetheless exude, in Essaydi’s work, a sense of their individuality perhaps best epitomizes the uncanny, almost mysterious ability of conscious em- bodiment to communicate selfhood. for the viewer. Largely illegible, text in Essaydi’s work equally functions as a screen, disrupting spectator identification with the portrayed women, thereby con- testing the long history of representation in which women were objects, rather than subjects of the gaze. in sum, Essaydi is overwriting women’s bodies literally to prevent them from being further overwritten discursively.